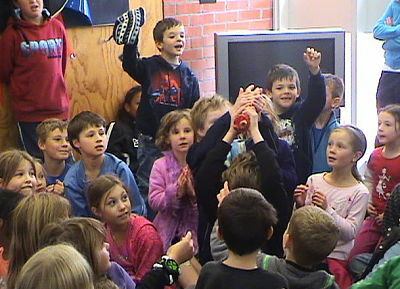 Approximately 100 adults and children crowded into Tawa Library on Monday 18th of April for the Slimy Science School Holiday Programme. The kids loved the fake severed arm! 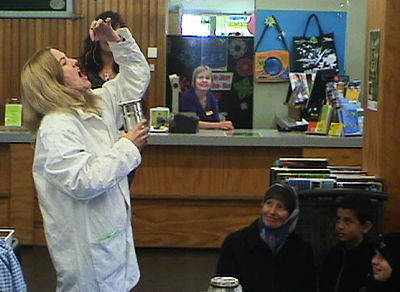 Susannah recited a rhyme from The Slimy Book by Babette Cole, and ate some “worms” in front of the children. 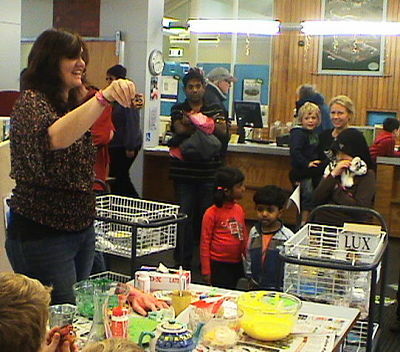 Sharyn showed the children how to make all different kinds of slime. The enthusiastic audience loved it! Here are the recipes for slime that Sharyn used. Make sure you get your parents to help you make them. In a glass or ceramic bowl, add 1/2 cup water and 1 cup white glue. Stir in 4 drops of food coloring if desired. In another bowl, dissolve 1/2 teaspoon borax in 1/2 cup water. Slowly add the dissolved borax mixture to the glue mixture. Stir well. When not in use, store in a tightly sealed jar. 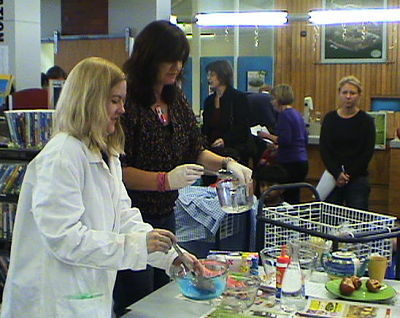 Susannah and Sharyn making some slime. Put the soap flakes in the bowl and pour the hot water over it. Mix the soap flakes and water with the wooden spoon until the soap flakes have dissolved. Leave it to cool then get stuck in and see how slimy your slime is. It will keep for a couple of days – just keep it in a container with a lid. Experiment with half a cup of your slime adding more water to it – how does it compare with the original slime? Add more soap flakes to another half cup of slime and stir it until the flakes are dissolved. Do the flakes dissolve as easily as they did in the hot water? What does it do to the slime? You can also beat your slime with an eggbeater until it’s frothy. How does it compare to the original slime? How long does it stay frothy for? Is it just as slimy? Put equal amounts of pva and cornflour & water in a sealable bag or bowl, and mix together. (The more cornflour you use the thicker it will become). Sharyn holding a shrunken "head." Really it's an apple!